The programme on this CD is built around the Italian songs of Dutchman Constantijn Huygens (1596-1687). Huygens was one of the central figures in the Dutch Golden Age, as he was secretary to the princes of Orange for several decades. Next to his political duties, Huygens was a passionate music lover, especially fond of the voice and the lute. His musical output is, except for a handful of compositions, found in the volume 'Pathodia sacra et profana' (Paris, 1647). The songs in this book are based in the tradition of the solo song, called seconda pratica, developed around 1600 by the work of Giulio Caccini and Claudio Monteverdi, among others. To show how Huygens' songs relate to genuine Italian compositions, his work is placed next to those of the most revered Italian composers of the time. In his early twenties, Constantijn Huygens travelled to Venice, where he attended a performance of vesper music conducted by Monteverdi himself. Alongside his travels, his unparalleled network enabled Huygens to become acquainted with new Italian music. Furthermore, many Italian songbooks found their way to the Netherlands, and it is known that Huygens had Italian music in his own library, for example Angelo Notari's Ahi, che s'accresce in me and Luigi Rossi's Anime, voi che sete. The most popular Italian songs were given Dutch texts by well-known poets such as P C Hooft and Huygens himself. As a result, Huygens must have had a good sense of the seconda pratica once he started to compose his own songs, but the French airs de cour were a source of inspiration as well. Huygens' Italian songs, therefore, show a highly interesting mix of the two most prominent seventeenth-century styles. On the one hand, we see the Italian treatment of dissonances as word-painting, and on the other, the simplicity and binary form of the French style. All the songs by Huygens are short and often end with an unexpected turn or joke. Such practice is also used by Huygens in his numerous and acclaimed epigrams. And of course Huygens, a true 'uomo universale', wrote some of his own song texts. Oscar Verhaar was born Rotterdam, The Netherlands and started his musical career as a treble in the Rotterdam Boys Choir, with whom he sang many solos both in The Netherlands and abroad (Switzerland, Austria, Russia and the US). 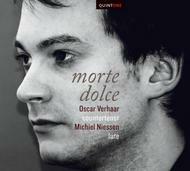 In June 2012 Oscar completed the Early Music Singing Master at the Royal Conservatory The Hague, where he studied with Michael Chance, Jill Feldman, Lenie van den Heuvel and Peter Kooij. In addition, Oscar studied with Lydia Vierlinger in Vienna and took masterclasses with Deborah York, Eric Mentzel and Kees Boeke. In October 2010, he had great success performing the role of Speranza in Monteverdi's 'Orfeo' for the Dutch Opera Studio, staged by Pierre Audi. In the same year Oscar won the first prize of the Austria Barock Akademie.